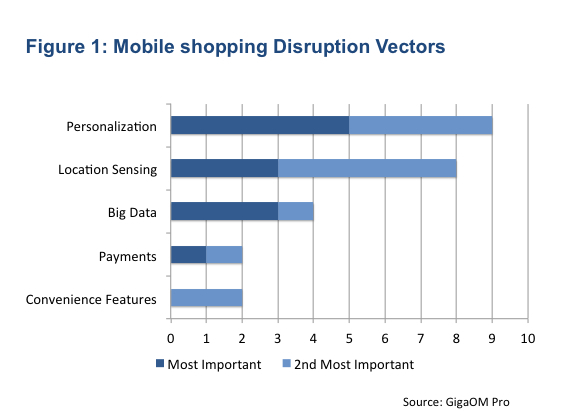 At last month’s Mobilize conference, GigaOM Research hosted a Mapping Session to probe attendees’ collective thinking on the most disruptive forces in mobile shopping. We wondered if the promise of mobile shopping depended on widespread adoption of nascent technologies like near-field communications, geofencing, or mobile payments, or whether other technologies could jump-start mobile transacting in the near future. To kick off the session, GigaOM Pro analyst Phil Hendrix shared some early survey results he’s currently working on at immr. Phil surveyed consumers about what they find annoying about shopping in order to help companies and retailers address those irritants and prioritize commerce features. Consumers seem impatient: They said they were often bothered by long waits at checkout or by slow mobile site downloads. Once they’d made a purchase, having the wrong product delivered was particularly frustrating, while going to a store and finding a desired product unavailable also rankled. Look for a GigaOM report derived from this research, and in the meantime check out a related Analyst Roundtable webinar “Retail in the cloud: Keeping shoppers in the store” where Phil adds a bit more detail. We often use Mapping Sessions to lay the groundwork for deeper analysis on emerging markets where we apply our Sector RoadMap approach. We’ve done Sector RoadMap reports on categories like the Platform as a Service market and work media tools. Sector RoadMaps are collaborative research efforts that match up competitors’ abilities to align with what we call Disruption Vectors, i.e., the key technology or market forces that drive emerging markets. Smart vendors can ride Disruption Vectors to gains in revenue or market share. During the Mapping Session, we discussed a number of different trends and technologies that could act as the Disruption Vectors for mobile shopping in the near term. The panel, along with the audience participants, considered and rejected technologies such as gamification and hardware-driven services like NFC or point-of-sale payments devices. While these may play driver/inhibitor roles in the future, their near-term impact is less crucial to market development – the former due to mass-market irrelevance, the latter to lengthier deployment cycles. The consensus was that social technologies and loyalty programs would be more important but not among the key Disruption Vectors. Those, and their relative importance, are illustrated below. Personalization. Session participants pointed out that, in contrast to web-based e-commerce, which is highly directed and driven by search, research, and price comparison, mobile shopping was likely to be more serendipitous or impulse driven. Yes, comparison shopping via showrooming is a very real phenomenon, but participants felt that personalization techniques such as well-targeted offers, shopping and wish list support, and reminders and alerts would affect the earlier, awareness and consideration stages of the shopping process, and drive people into stores. Location sensing. Location and context are components of personalization as well. Simple things like QR codes and mobile apps that access catalog info and user reviews will have a bigger near-term impact, but GPS-targeted offers and geofenced stores excited the room. Perhaps we’ve all got Minority Report – or ShopKick – on the brain. Big data. Data analysis can feed personalization, but companies can also dig deep and recognize patterns they can mine to craft pricing and inventory management strategies in stores to complement mobile access and offers. Established players with access to cross-channel purchasing information like Wal-Mart, Best Buy, McDonald’s, and the credit card companies are better positioned to mine that big data than are startups like Foursquare or Groupon. Payments. Mobile payments systems may depend on creating cross-merchant or -category loyalty programs for adoption. So far, the convenience angle hasn’t accelerated consumer or merchant deployment. Convenience features. This category represents a catch-all for cloud-integrated services like in-store pickup, checking inventory availability, faster checkout, etc. We also discussed loyalty programs and various social media and social commerce angles, but they didn’t resonate with the session participants as much as the Disruption Vectors described above. There’s a bit of redundancy in that list, and some technologies are means to others’ ends. We’ll continue to refine our analysis of the sector. Meanwhile, Mike Wolf describes the results of another Mobilize Mapping Session on navigating the appconomy in this post. Previous Mapping Sessions kicked off the PaaS Sector RoadMap and looked at how Infrastructure as a Service could commoditize other IT sectors. We welcome your feedback on these disruptive trends, and on what might accelerate the success of mobile shopping. Have we missed or mis-emphasized anything that you believe will be key to driving the sector over the next 12 to 24 months? Continue the discussion by leaving a comment below.